I scream, you scream, but Edvard Munch’s famous The Scream might not be screaming, as indicated by a rare version of the artwork. Come 11 April, the British Museum will unveil a black-and-white variation pointing that the iconic figure is not the one crying—his surroundings are. Munch also described that, when walking by a fjord facing the Norwegian capital of Oslo, he saw the sky turn blood red, and a profound wave washed over him. The caption, Bartrum adds, was “very deliberately included” so Munch could explain—in his very own words—about the anxiety he felt at that moment. “He was trying to capture an emotion or moment in time. Through the inscription, we [now] know how he felt,” the curator says. Bartrum insists that she has “no doubt” the figure in The Scream is listening to nature’s intense vibrations. Still up for debate, though, would be whether the forces are physical or psychological. The question on whether the person in the artwork is screaming or hearing has been around for awhile, but the beautiful thing about art is it’s always open to interpretation. During the Cold War, Henrichsen cites, TIME magazine featured the painting on its cover in reaction to the troubling era and the atomic bomb. 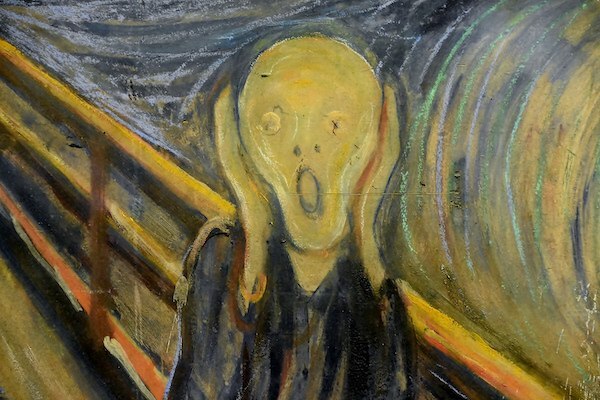 Recently, English people have been illustrating Brexit with The Scream, he adds. “People can interpret and enjoy art in different ways,” he tells the Telegraph. The Scream will headline the Edvard Munch: love and angst display, alongside about 50 loans from the Munch Museum, at the British Museum between 11 April and 21 July. The exhibition will be the UK’s largest one devoted to the artist in 45 years.